Every so often I’ll come across a section of a book that will stop me and I’ll have to read it 100 times to think about how I can properly get this point across to entrepreneurs as they struggle to build a business. I’m knee-deep in my January book list and I’m loving what I’ve read so far. Right now, I’m reading a book that you’re going to have to open your mind to be able to read. If you aren’t about an F-Bomb, this book is likely not for you. Personally, I sometimes think that a cuss word or two (or 100) makes me pay a little more attention to the words because it’s not what most would consider “professional”…or so I’ve been told. I’m reading a book called The Subtle Art of Not Giving a F*ck: A Counterintuitive Approach to Living a Good Life by Mark Manson. Again, I warned you about the cusses. There are lots of them but if you can be okay with them, you’re going to learn something here and you’ll probably laugh along the way. There’s this common issue I find among entrepreneurs and that is how hard they try to stay off of the strugglebus. I mean, they’ll really work at it, sometimes harder than just buckling down and doing what needs to be done. Then that doesn’t work out (because SPOILER ALERT: the struggle bus is the only route to entrepreneurial success) and they complain. And when that doesn’t move their business forward, well, that’s when they quit. I see it all the time. Quitters everywhere because the struggle wasn’t worth the reward. How many times have you heard, “My business isn’t growing like INSERT NAME HERE” or “This is just not fast enough” or “I thought it would be faster” or “This just isn’t for me” from someone struggling to grow their business? I hear it A LOT. It’s a resounding message in the emails I get asking for advice. It’s frustrating because there isn’t much I can say back to that person except to start rattling off things they haven’t tried before. At best, that holds them over until those things don’t work fast enough either. You know what that is? It’s entitlement. It’s entitlement disguised as frustration. 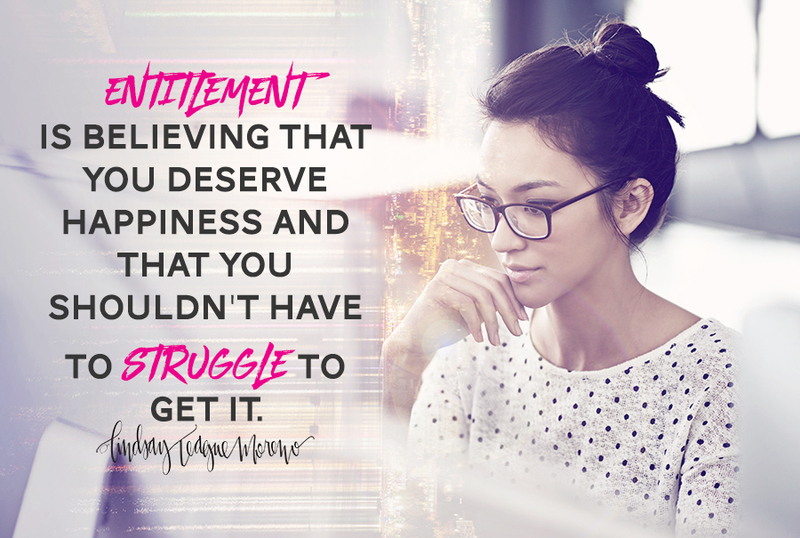 Simply put, entitlement is believing that you deserve happiness and that you shouldn’t have to struggle to get it. Here’s the thing, nobody gets a struggle-free ride, even if the people you’re wrongly comparing yourself to (hand slap) have social media feeds that are lying to you about their perfect lives. And guess what? We don’t deserve a a struggle-free ride either. We deserve nothing. We are entitled to nothing. Entrepreneurship is a struggle. Every day. Even if you grow fast, it’s still a struggle. The struggles are just a little different. We ALL have to pay our dues. At one point or another, we all have to learn the lessons about how to reach people and how to connect with our customers in a way that helps our businesses grow. Most people aren’t innately and divinely born with that knowledge. We need to embrace the amount of time it takes us to make our business our success story. There’s no boss to fire you. You can choose to not fail (which is great for anyone who is afraid of failure). For some of us, our ride on the strugglebus for this particular journey is going to be shorter because we likely have a long list of failures, misses, dead-wrongs, and growth opportunities in our past. We already saw that struggle though at one point which makes this one seem like a shorter ride. What I want you to understand is that hard is required to own your own business. Nothing worth having is easy. We don’t need to be frustrated that it’s hard and it takes a long time. I want us to be thankful for it. The harder it is, the more we’re learning and that’s going to give us a shortcut down the line. I want us to be like Lieutenant Dan strapped to the top of that shrimp boat yelling at the storm to “bring it!” We need to own the struggle because it’s required. Your attitude about having the get on board the strugglebus is what determines your fate because you can’t get ANYWHERE without it. It’s the only ride to business success. Might as well choose a seat. Lean into the struggle this week. Own it as part of your job rather than be frustrated because it’s holding you back. The sooner you accept it the sooner you grow. Have an amazing, difficult week!